P1	P2	P3	P4	P6	P12 What are Natural Resource Charter precepts? Natural resources play an important role in Ukraine’s economy. While the country itself is rich in numerous resources—including oil from deepwater offshore reserves and natural gas from shale—it also serves as a crucial transit hub for resources from neighboring countries, specifically the natural gas that travels between Europe and Russia. But due to entrenched corruption and inefficient regulatory practices, Ukraine’s natural resource sector has come nowhere close to realizing its full potential to drive economic growth and foreign investment. Transparency and accountability rose to the top of Ukraine’s agenda in 2014, thanks to the “Revolution of Dignity” that shook the country and brought in a new, reform-minded government. Hopes were high that Ukraine was on the path toward improved transparency, especially because the country had joined the Extractive Industries Transparency Initiative (EITI). But while the EITI has gained widespread support over the past four years, Ukraine remains deeply beholden to a Soviet-style bureaucracy that inhibits both transparency and accountability; the voluntary principals that drive initiatives like EITI and the Open Government Partnership are alien to many in the government. It seemed that real progress could only be achieved via legislative action that would make improved transparency and accountability a legal obligation. The Natural Resource Governance Institute (NRGI) has worked on resource governance issues in Ukraine since 2009. Initially, the organization’s work concentrated on assisting local civil society organizations that advocated for Ukraine to join EITI (and by so doing disclose vital information about energy transit projects). But over time, NRGI began to partner with the International Renaissance Foundation to produce analytical materials on resource transparency, and also worked with organizations like the DiXi Group—an analytical start-up that has gradually become one of the country’s leading think tanks working on resource governance. In 2016, NRGI staff worked with the DiXi Group to compile data for the Ukraine section of the 2017 Resource Governance Index (RGI), an NRGI publication that measures the quality of governance in the oil, gas and mining sectors of 81 countries. Ukraine’s oil and gas sector overall scored a relatively weak 49 of 100 points and it was ranked 4th among the 9 countries covered in the Eurasia region. The RGI findings were launched during a public hearing held by the energy committee of the Verhovna Rada (Ukranian parliament). Among the hearing’s participants were parliamentarians, representatives of the Ministry of Energy, the Ministry of Ecology and Natural Resources, extractive companies, international organizations, agencies and specialized NGOs. The discussion touched on the causes of inefficiency in Ukraine’s legislation and policies in the extractive industry, explored possible reforms that would improve the sector’s investment climate, and surfaced recommendations for the integration of governance best practices into Ukraine’s laws and policies. 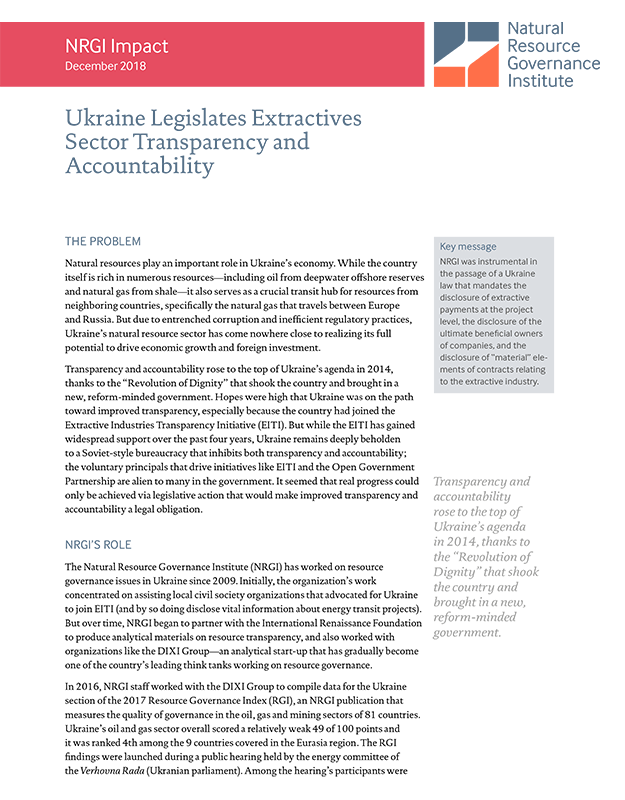 Various publications resulted from the hearings, including analytical materials published by the DiXi Group, a policy note entitled Resource Governance Index: Homework for Ukraine that was created with NRGI’s support and, crucially, a roadmap for resource governance policy reform that highlighted the weaknesses of the extractive sector and opportunities for improvement. The first step in this roadmap was the adoption of new legislation on sectorial information disclosure, and in the months following its publication a first draft of the law was prepared by the DiXi Group and a group of parliamentarians headed by Olga Belkova, deputy head of the Committee on Fuel and Energy Complexes, Nuclear Policy and Nuclear Safety. Later versions of the law benefited from comments given by NRGI staff and the incorporation of various RGI findings. On 18 September 2018, the “Law on Ensuring Transparency in the Extractive Industries” was passed into law. This law sets out legal principles for the collection, disclosure and dissemination of data on Ukraine’s extractive industries. It mandates the disclosure of payments at the project level, the disclosure of the ultimate beneficial owners of companies, and the disclosure of “material” elements of contracts relating to the extractive industry, such as social obligations, building infrastructure and barter arrangements. This legislative milestone was followed by a government-approved Action Plan for Reforms, which incorporates measures proposed in the Roadmap for Resource Governance Policy Reform developed by DiXi Group with NRGI’s support. The roadmap consists of numerous government actions, from reforming the licensing process (including changes in the existing legistations and practices) to a number of actions aimed at creating new norms of disclosure and reporting. The law’s ratification is the first step in the “reform roadmap,” a campaign to mainstream transparency and accountability frameworks and laws across the various government bodies and private sector actors that are involved with the natural resource governance sector. The new law and reform action plan mark the beginning of a new era of transparency and accountability in Ukraine, and NRGI will continue to provide technical assistance to Ukrainian actors so that the laws and roadmap are implemented.